Darrell Wade Potter, age 49, passed away November 7, 2018 at home with his wife by his side after a 7 month battle with cancer. He is now at peace in the Hands of God. He was of the Episcopal faith. Darrell and his wife, Shelly, shared a love for animals and nature. On their farm they grew vegetables and flowers and nurtured many animals including Tennessee Walking Horses. His hobbies included fishing, hunting, archery, guitar, and working on the farm. 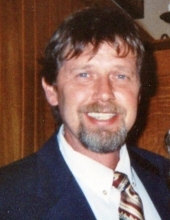 With his family he enjoyed horseback riding, motorcycling, and taking their ATVs to Windrock. Darrell received several associate degrees and certificates in the field of robotic engineering. He was employed by KoneCrane as a crane specialist. Darrell was preceded in death by his father, Billy Potter. He is survived by his wife, Shelly Comeaux Potter; daughter, Amber Potter Asmi of Chattanooga; son, Austin Potter of Dandridge; stepson, Carter Burnett of Knoxville; mother, Sheila Potter Brown; stepfather, Stephen Brown; sister, Rosetta Dawn Brown; brother, Stephen Brown of Crossville; brother, Neal Potter of Baxter; sister, Cristy Potter Dykes of Virginia; mother-in-law, Barbara Comeaux; brother-in-law, Jeff Comeaux of Knoxville; and many nieces and nephews. Family will receive friends 10-11am on Saturday, November 24 at Click Funeral Home Farragut Chapel with a funeral service to immediately follow at 11am, The Reverend Christopher Hogin, officiant. To send flowers or a remembrance gift to the family of Darrell Wade Potter, please visit our Tribute Store. "Email Address" would like to share the life celebration of Darrell Wade Potter. Click on the "link" to go to share a favorite memory or leave a condolence message for the family.